I had a bad experience with my wedding photographer, leading to my misguided impression that photographers work only with their DSLR camera. I was hesitant to engage a photographer for a pregnancy photo shoot, but since I did not have one with my first child, I decided to have a maternity photo shoot for this second pregnancy. So I checked out a few companies. Most do not return the soft copies or charge you an arm and a leg for them while others did not even respond to my queries about purchasing additional photos. Then I saw JJ’s website. What drew my attention was that he returns clients all their soft copies of their photo session so I decided to email him. He responded pretty fast, calling back personally and explaining that everything will take place at the convenience of my home. He also answered all my enquiries patiently. On the actual day itself, we scheduled our photo shoot at 4 pm. I was late, but he waited patiently at my doorstep. When I reached home, I was amazed at the amount of equipment he came with. Everything he used was of a professional level – lights, backdrops, props. Within 45 minutes, he was all set up and ready. I was so impressed that my living room had been transformed into a professional photo studio. Before we began, JJ asked patiently what we were looking for in our pictures. What our expectations were and so on and so forth. Throughout the photo shoot, I felt really relaxed and I thoroughly enjoyed myself. Being heavily pregnant tired me out easily during the photo shoot. Nevertheless, JJ banters with us, cracking jokes which helped me to focus on the session. Every time he had to change his equipment or lighting, he willingly shared the reason for what he was doing. For every different position, he had to readjust his lightings. He is not a photographer who rushes through his work. Instead he works with patience, lots of it. I definitely learnt a lot about photography from JJ. More importantly, he takes pride in every photo that he takes. I’m far beyond impressed with the outcome of my pictures. On behalf of my little family, I thank you, JJ, for the beautiful pictures and that wonderful experience at the photo shoot! 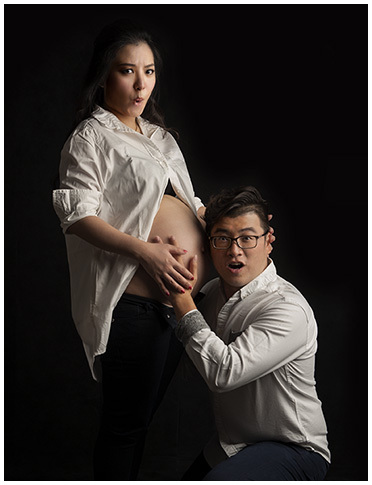 This entry was posted in Maternity Photography, Pregnancy Photography, Testimonials.